Around ’98/’99 I was getting into turntablism in a big way and at that time the Scratch Perverts were the kings of the UK scene. They were technically stronger than anyone else as well as keeping it funky, and eventually went on to innovate the artform with feedback techniques that had never been seen before. Simultaneous to this, Rawkus stepped into the limelight with a plethora of releases that brought quality underground hip hop back to the masses. I remember snapping up almost anything that had the Rawkus name stamped on the cover: it was an almost definite indicator of a slammin’ release. Never before had I had such confidence in a contemporary label and I can only imagine what it was like for rap music fans during the golden age when Def Jam and Tommy Boy were at the height of their powers. Of course, things turned sour for the label around 2000, but it seems like they might be making a resurgence; let’s hope so. Given away with HHC, ‘The Cleaner’ features a selection of the Rawkus classics from this era and lets the Perverts work their magic on them. Featuring cuts from Ripshop, Mr Complex and Common as well as others, this is a seemless mix that demonstrates the skill of the Perverts whilst still allowing the selections to shine. Perhaps the most technically striking moment in ‘The Cleaner’ is the outro to Shabam Sahdeeq’s ‘Every Rhyme I Write’: pure turntablism genius. I’m not sure what the exact Perverts line-up was at this stage as they have been through several incarnations, but I suspect that this was after the departure of Mr Thing and First Rate but before the re-induction of Scotland’s Plus One. 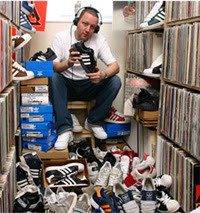 I’m also posting a couple of mixes taken from a John Peel radio session coutesy of Sconeboy. First up is Prime Cuts followed by Mr Thing (my favourite UK DJ of all time). I would estimate that these were recorded c. ’98 as the Prime Cuts section features his ‘Jack Of Spades’ juggle which he was busting out at both the DMCs and ITFs around that time. Both mixes are of an exceptional standard featuring classic hip hop joints as well as the odd well known break.